Home > Legal Articles > Criminal Law > What Happens at a Criminal Trial? A defendant who is charged with a criminal offense has the right to demand a trial on the charge, and in most cases has the right to a trial by jury. The prosecutor also has the right to demand a jury trial, although prosecutors are usually happy to agree to bench trials. In a jury trial, a judge presides over trial proceedings while a jury hears the case and makes a determination as to the defendant's guilt. The jury decides issues of fact, meaning that the jury interprets the evidence, decides whether it believes that the prosecution has proved beyond a reasonable doubt that a crime occurred and that the defendant committed the crime, and renders a verdict. The judge decides issues of law, and instructs the jury on the law that applies to the case. 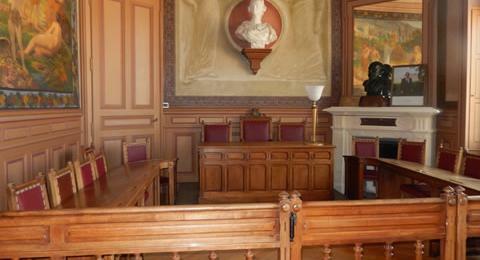 A bench trial occurs when the trial is heard by a judge alone. The judge decides both issues of law and fact, and renders a verdict against the defendant. If a case is scheduled for jury trial, the parties engage in a process of jury selection, through which the court empanels potential jurors who then go through a selection and screening process to try to ensure that the defendant's jury will be fair and impartial. A pool (or panel) of prospective jurors is summoned to the court to perform jury duty. Members of the pool are randomly selected to sit on the jury panel and, once selected, are questioned. Depending upon the court, the questioning may be conducted by the attorneys, by the judge alone, or by both the judge and the attorneys. This process of questioning is called voir dire. Objections for Cause: An objection for cause asks the judge to strike a juror from the panel based upon the assertion that the juror cannot be fair or impartial in deciding the case. The judge evaluates the objection and decides whether or not it should be granted. The parties may make an unlimited number of objections for cause. Peremptory Challenges: A peremptory challenge asks a court to remove a prospective juror from the panel without any further explanation or demonstration of cause. The parties are limited in the number of peremptory challenges that they may exercise. Once a panel of jurors is approved by the prosecutor and defense, the panel is sworn in. This is an important point in a trial, as it is the point where jeopardy is said to attach. If case is later dismissed for reasons not attributable to the defense, once jeopardy attaches the defendant cannot be again tried for the same offense. At the start of a trial the jury will be given preliminary instructions. Among the instructions given, the jury is instructed at this time that the defendant is presumed innocent, and that the presumption of innocence does not change until the jury begins deliberations. Jurors are not supposed to abandon the presumption of innocence before hearing all of the evidence in the case. After the jury has received its instructions, the attorneys will present opening statements. An opening statement describes what a party expects the evidence to show. The prosecutor will assert that the evidence will support conviction beyond a reasonable doubt, while the defense will assert that the prosecution will fail to meet that high burden of proof and that the defendant should be acquitted. In some jurisdictions, the defendant may be permitted to delay making an opening statement until after the prosecution presents its witnesses and evidence. Direct Examination: The party who has called the witness questions the witness, and may introduce other evidence through the witness. Cross-Examination: The opposing party questions the witness to try to undermine the witness's testimony or to otherwise cast doubt on the other party's version of events. Re-Cross and Re-Direct: The parties may engage in a subsequent questioning of the witness, generally by leave of the court, on matters raised during cross-examination. If during testimony a witness is asked to introduce evidence, the party seeking admission of the evidence must lay a proper foundation for its admission, essentially proving that the evidence is authentic and that the witness is qualified to establish its authenticity and to introduce it into evidence. The opposing party may challenge the foundation before the judge rules on the admissibility of the evidence. The defendant in a criminal case cannot be compelled to testify against himself, but he has the right to testify in his own defense if he chooses to do so. In many criminal cases the defense will not present any witnesses, either because the prosecution called all of the relevant witnesses during its case, or because the defense intends to argue that the prosecutor's case is insufficient to justify conviction. Some cases involve expert witness testimony, in which an expert is called to testify about a matter outside of the normal realm of a layperson's knowledge. An expert may share opinions based upon the evidence, or based upon hypothetical questions that relate to the litigation. If a witness is called as an expert witness, the opposing party may conduct voir dire of the witness to verify that the witness is qualified to testify as an expert. At the conclusion of the defendant's case, the prosecutor may present rebuttal witnesses to respond to arguments or evidence introduced by the defendant. Sometimes, the defendant will be allowed to present rebuttal to the prosecutor's rebuttal. After all of the testimony has been taken, the attorneys present their closing arguments. The prosecutor presents first, presenting an argument as to why the defendant is guilty beyond a reasonable doubt. The defense then presents its argument as to why the defendant should be acquitted. The prosecution then presents a brief rebuttal argument, challenging the defense argument. Closing arguments present the parties with their opportunity to summarize the evidence in the light most favorable to their position, and to present theories of guilt or innocence based upon that interpretation. However, the parties are expected to limit their arguments to evidence that was heard and admitted during the trial. In a jury trial, sometimes a defendant will bring a motion for a directed verdict of not guilty, meaning that the judge instructs the jury that they must return a not guilty verdict. These motions are often made, but are rarely granted. The defense may also present motions for the dismissal of some of the charges filed against the defendant, or a narrowing of the possible charged for which the defendant may be convicted, based upon the evidence that was presented at trial. For example, if a defendant is charged with open murder, meaning that the jury could return a conviction on any homicide charge from first degree murder to manslaughter, the defense may argue that the prosecutor failed to present evidence of premeditation such that the jury should not be permitted to deliberate on first degree murder charges. Either party may bring motions or present arguments in relation to how the jury is to be instructed prior to its deliberations. Following the closing arguments, the jury is given additional instructions, and then commences deliberations. The jury chooses a foreperson who takes a leadership role during deliberations, and who speaks for the jury in court. In federal court and in most states, a jury verdict must be unanimous in order for the defendant to be convicted of a crime. If the jury cannot reach a verdict, the judge will eventually declare a hung jury and discharge the jury. The prosecutor must then decide whether to dismiss the charges or to request a new trial. When the jury reaches a verdict, the foreperson presents the verdict to the court. The parties may then ask that the jury be polled, meaning that each juror is asked to individually state whether or not they agree with the verdict that was presented by the foreperson. If the jury reaches a verdict, or upon the conclusion of a bench trial when the judge issues a verdict, the defendant may be convicted of all charges, convicted of some charges but acquitted of others, or acquitted. If a defendant is charged with more than one offense, the jury may convict the defendant of some charges while acquitting of others. A lesser included offense is a crime that shares its elements with a more serious offense, and must be committed as part of the more serious offense. For example, trespassing is a lesser included offense of burglary, because you cannot commit the crime of burglary without trespassing upon somebody else's property. If a defendant is charged with an offense for which there is a lesser included offense, it is possible for a defendant to be acquitted of the more serious charge but convicted of the lesser, included charge. If a defendant is acquitted after trial, with the judge or jury finding the defendant "not guilty", the criminal case is usually over. In the United States, the prosecutor may not appeal an acquittal. In rare cases, a defendant may be subject to a subsequent prosecution. For example, a defendant who is charged with a race-based homicide might be subject to a civil rights prosecution in federal court, despite having been previously acquitted in state court. If the defendant is convicted, the defendant is normally scheduled for sentencing based upon the conviction. In some cases, particularly minor offenses, the defendant may be sentenced immediately. In more serious cases, the defendant will normally meet with a probation officer before sentencing, and have a formal sentencing hearing for which the probation officer will recommend a sentence. If a defendant is not in custody, the defendant may be remanded to custody following a verdict of guilty. After conviction, a defendant may file post-trial motions, such as a motion for a new trial or for a verdict of acquittal notwithstanding the jury's conviction. Post-trial motions are rarely granted. The defendant may also file an appeal.